When we first moved into our townhouse last year the front porch left a lot to be desired. 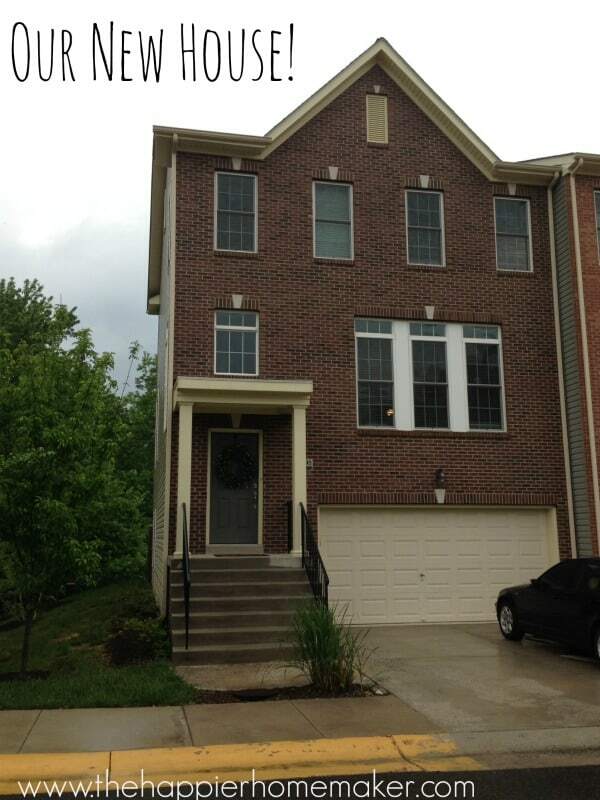 In a sea of similar looking townhouses, it looks cold and unwelcoming. These days, it’s a lot more welcoming! 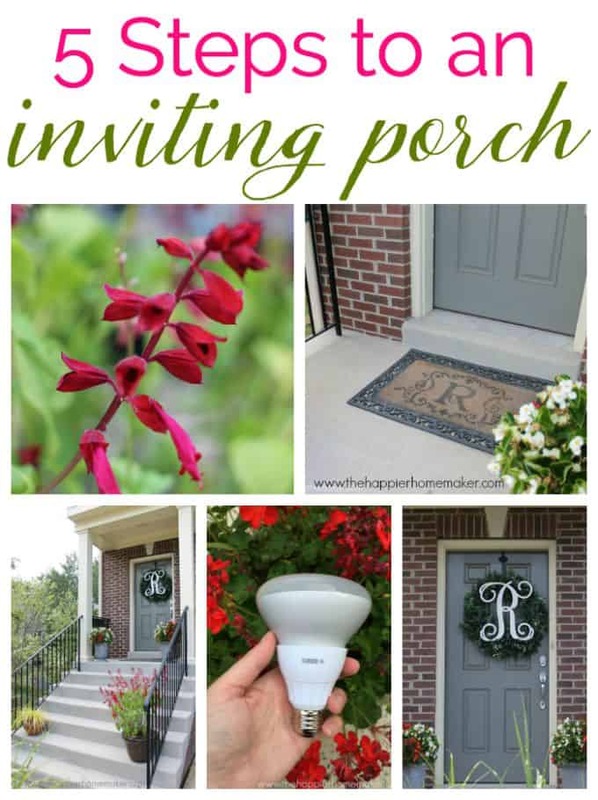 The other day I was driving around and I noticed that we are one of the few homes in our area that has a “decorated” entry and it got me thinking about what makes a welcoming front porch…I narrowed it down to an easy 5 step plan to create an inviting porch! 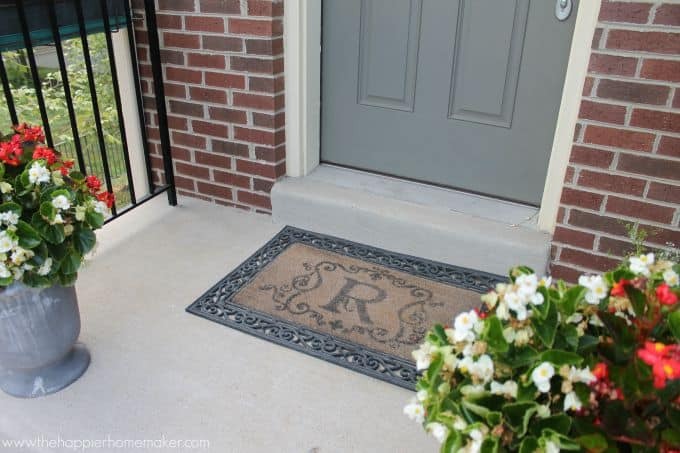 Now that you’ve made sure your entry way is safe, add a door mat to welcome guests and reduce tracking of dirt into the home. We picked up this monogram mat a few years ago (and I just realized when taking these pictures that it’s probably due to be replaced!) and added on the rubber frame and I love it-it really takes what would be a plain doormat and makes it a teeny bit more special. 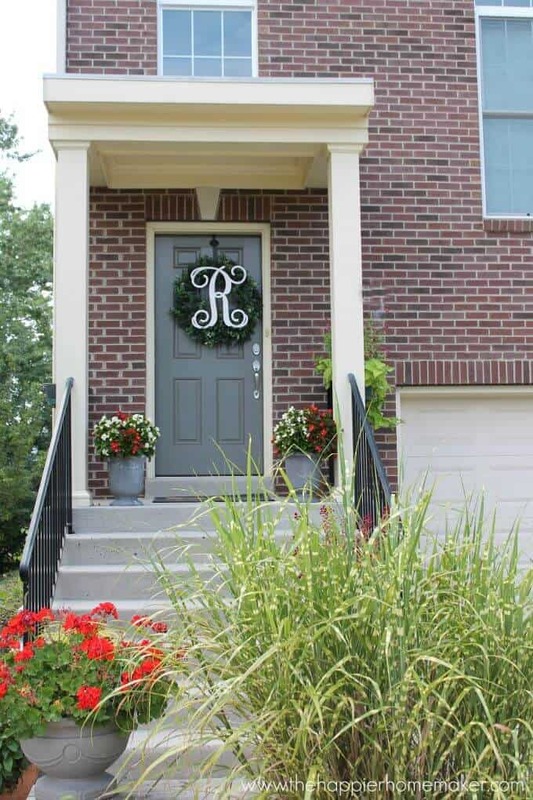 Hanging a wreath on your door is such a simple way to decorate your entryway, and you can show your personality as well! I love switching out wreaths seasonally and have quite a collection building up. You can easily make your own (see all of my wreath tutorials here) or buy a versatile one you can change out accessories on like I did here. I’m a plant hoarder, I love having lots and lots of plants to dress up my outdoor areas-it’s like jewelry for your house! 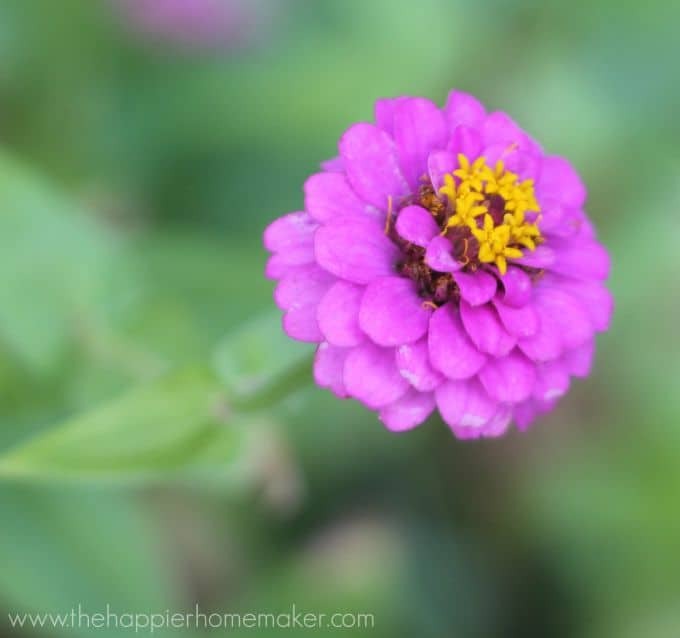 This summer I’m loving my standard favorites of zinnias and sweet potato vine in my window box hanging on our porch and of course I always have geraniums and begonias! I also have a few new favorites this year I picked up from the Southern Living plant collection-a gorgeous Saucy Red Salvia and that fun Evercolor Everillo Carex. 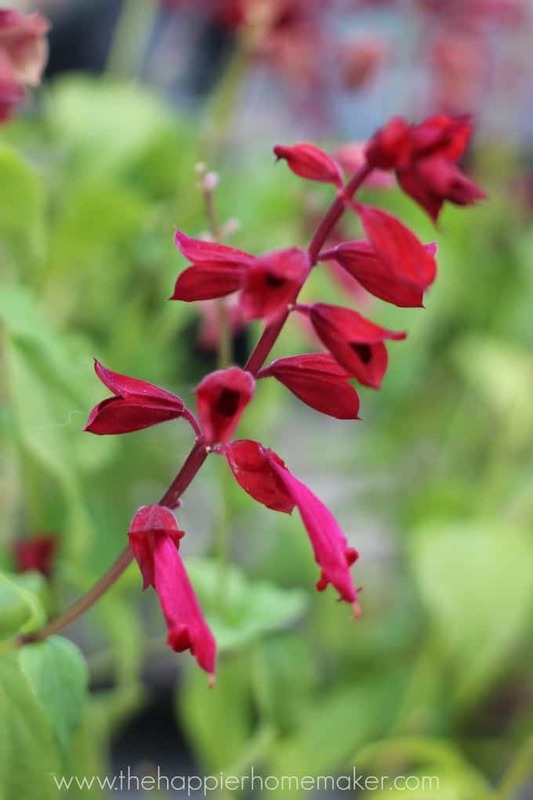 The Salvia really goes with my other red favorites and the Carex balances the chartreuse of the sweet potato vine! 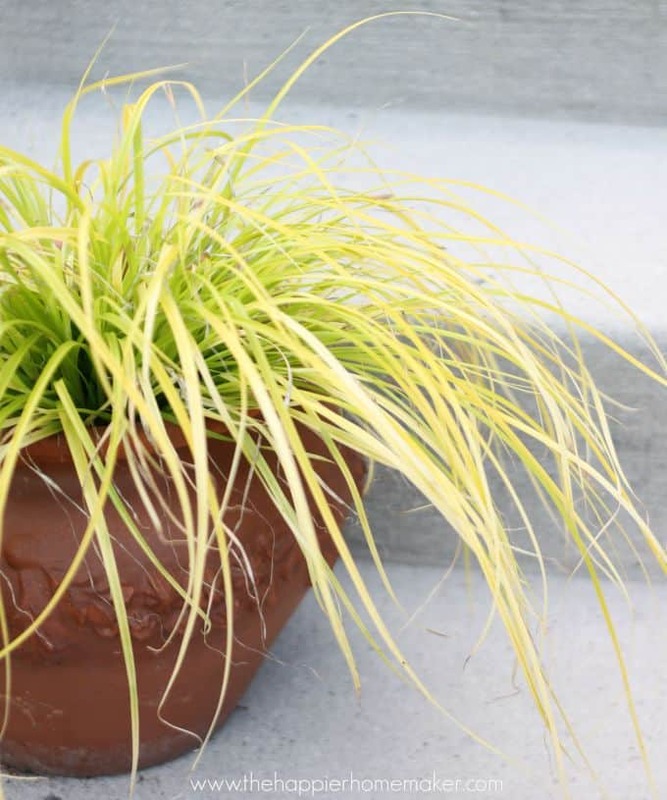 You don’t have to be a green thumb to add some plants to your entry way-pay attention to how much sun the area gets and choose hardy plants suitable for those conditions. 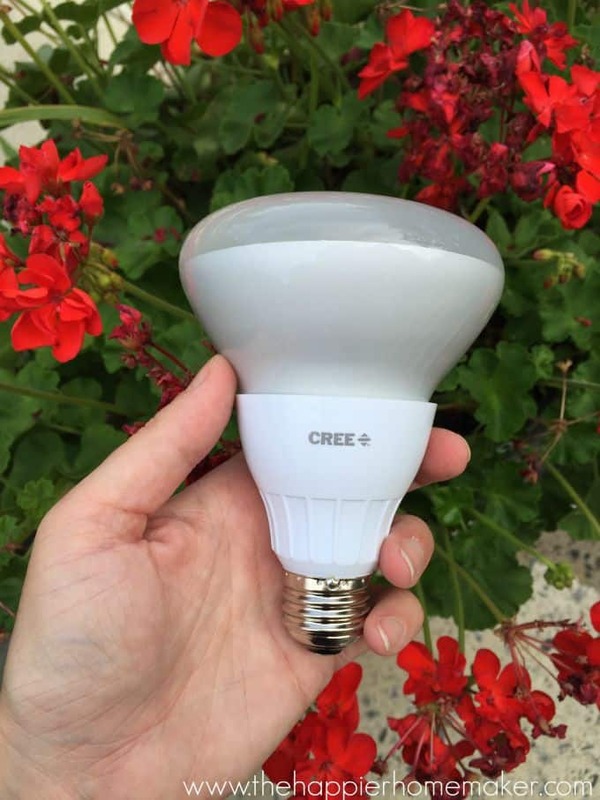 Now for the fun stuff–do you want a chance to win a $70 CREE LED bulb prize pack?? Seriously, these bulbs are revolutionary! 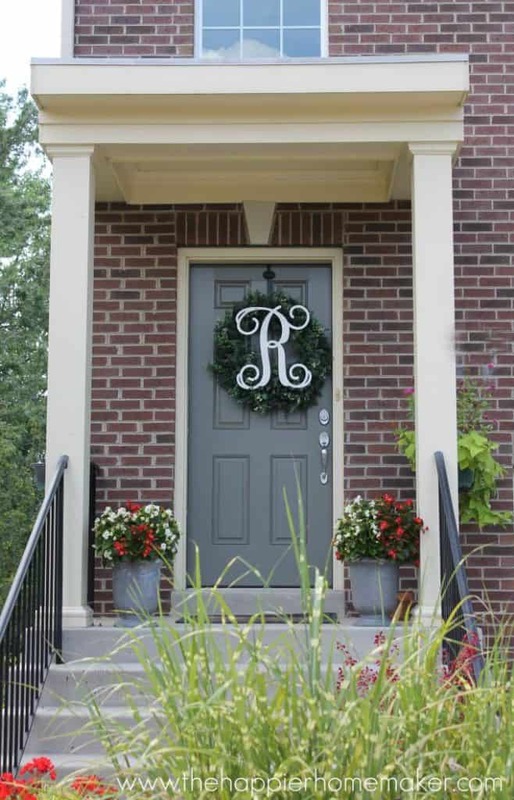 To enter leave me a comment telling me your favorite way to make your porch (or entryway if you don’t have a porch) more inviting! I’ll choose a winner August 12th! Any advice for those with double front doors? I’ve been hesitant to do two full wreaths because I’m worried it’ll look too busy. Thanks! We had a house with double front doors about 5 years ago and I totally embraced the double wreath look Jen! I’d keep the wreaths more simple to avoid the busy look but I love the symmetry of it. I didn’t have my blog yet back then, otherwise I’d show you a picture. I like to use plants, especially ferns. You’ve totally convinced me to up my porch game! I think flowers and a good light make all the difference in the world! I love our LED lighting outside! I don’t stress if we forget to turn the porch lights off in the morning! I have been thinking about changing my walnut stained front door to a painted one to give my entrance a fresher look. Even though my door in under a porch, it gets lots of harsh sun in our deep south climate. I find the varnish just doesn’t hold up as well as I would like. I wonder how well an exterior latex paint would fare any better. I have done the seasonal wreaths, added a new flower bed along the walkway, hung a flag that says, “welcome to the nuthouse” (it has a squirrel on it) and I have sidewalk lighting, but a poor front porch light. I usually get a fresh hanging basket every year, but I do need to freshen up my doormat, it has seen better days. If there’s enough room, I love a cute bench or two chairs with decorative pillows! These 5 ideas are great! Thanks! The entry looks great now, Melissa! Great additions! Your porch looks so cute! I used to have a wrought iron fence outside my apartment door. I would wrap it up depending on the season, leaves for fall, garland with ornaments for Christmas, red velvet for valentines day, etc. I’m an animal lover, especially cats, so I have a garden flag post at my entry and change flags with each season and/or holiday. All the flags have at least one cat in it. My neighbors stop me and tell me they look forward to seeing what my new flag will be….I also change my door wreath a few times a year. I bought two tall planters, have them on either side of my front door, I put flowers in them in the summer, stacked decorated plastic pumpkins in them in the fall and miniature Christmas trees w/lights in them during the holiday. They look great! I have a bigger porch with 2 rocking chairs and a small table. I change pillows or have a throw over the tops of them. I also have two planters by the door with seasonal plants and a collection of galvanized watering cans. They sometimes hold plants as well. Best addition is a light by the door that comes on automatically (motion sensor) so always able to find my house key and the door lock! My door mat also ready for a change and I love your rubber mat holder. I love these Ideas. As I love shutters, I’d place a shutter on each side of the door to broaden the entry and make the door appear wider and more inviting. We are kinda bicoastal!! In January, February, March until mid April, we spend our time at home in Southern California. I make sure I always have a pretty light at the door and a cool basket of colorful flowers on the ledge next to my doorbell. Updating your doorbell and your doorknobs make such a difference and making sure that you have fresh paint on the house… And of course, keeping it clean, makes all the difference in the world. We spend mid April, May, June and early July in Georgia! Not being in either location full-time requires a lot of creative thinking to make your place look lived in and welcoming. I allow the moss to grow on the steps to my front door, pain in our house mustard with the front door being a dark brown craftsman and then I plant red orange & yellow begonias in cool pots on my tiny steps that lead up to the door. When the begonias die, I will place a large piece of pottery with Reggie rainy to offset the mustard and brown house and then when we are gone, I will put the lid on the piece of pottery.